Art: "Voyage" by Eve Fouquet. Stevenson said of his now classic novel The Strange Case of Dr. Jekyll and Mr. Hyde, it was "conceived, written, re-written, re-re-written, and printed inside ten weeks" in 1886. The conception came in a dream: "For two days I went about racking my brains for a plot of any sort; and on the second night I dreamed the scene at the window, and a scene afterward split in two, in which Hyde, pursued for some crime, took the powder and underwent the change in the presence of his pursuers." 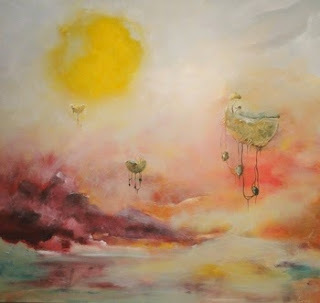 Stevenson described the central role of dreaming and dreamlike states in his creative process in “A Chapter on Dreams”. During his sickly childhood, he was often oppressed by night terrors and the “night hag”. But as he grew older, he found that his dreams often became welcome adventures, in which he would travel to far-off places or engage in costume dramas among the Jacobites. He often read stories in his dreams, and as he developed the ambition to become a writer, it dawned on him that a clever way to get his material would be to transcribe what he was reading in his sleep. “When he lay down to prepare himself for sleep, he no longer sought amusement, but printable and profitable tales.” And his dream producers accommodated him. He noticed they became especially industrious when he was under a tight deadline. When “the bank begins to send letters” his “sleepless Brownies” work overtime, turning out marketable stories. 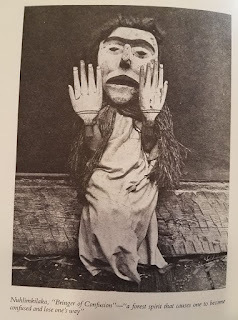 In his “Chapter on Dreams” (written in his house on Saranac Lake in upstate New York and published in Across the Plains) RLS gave a vivid depiction of his dream helpers. Her face is as round as a peasant loaf. Her smile lights up the room. Her simple garments are the color of flax or of wheat. She is fair and she is vast, built on a scale larger than humans. 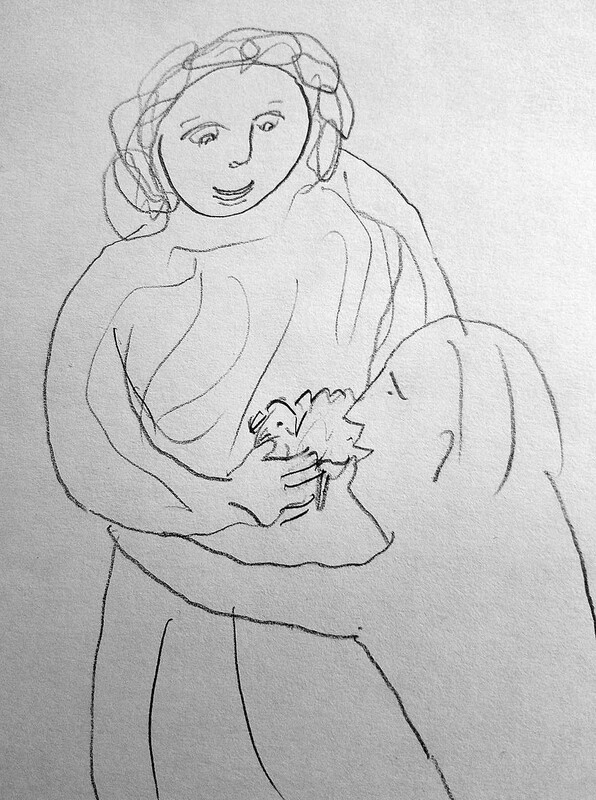 I know her as Mother and she receives me into her arms as a mother reaches for a child. She tells me she will give me strength for the work I have undertaken. I must open my mouth to receive. I don't hesitate. I would trust her with my life. She produces something very small and white and fluffy. It fits inside the palm of her hand. I am amazed to see it is a lamb. Are they ever this small? 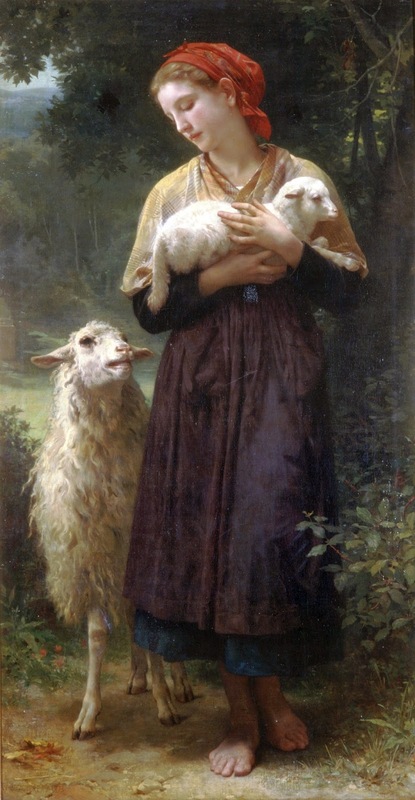 She holds the lamb against my face. I smell milk and the fresh goodness of the wool, which is wonderfully soft against my skin. She parts the wool and holds the lamb to my mouth. The meat is sweet. It tastes more like fruit than flesh. I bite deep and the blood pours down my throat. There is no disgust. The blood tastes like wine. I continue to eat until all that is left is a tuft of white wool. Now you are ready, she tells me. I leave the scene and open the eyes of the body I left sleeping on my bed. How do I feel? I feel blessed, and grateful, and amazed. It occurs to me that my dream of being offered the blood and flesh of a lamb comes at the time of Passover, when Jews celebrate the liberation of the Israelites from Egypt. In the Bible story, the God of Moses sent plagues against Egypt to compel Pharaoh to let his people go. The Israelites were instructed to mark the doorposts of their homes with the blood of a sacrificed spring lamb; seeing the blood of the lamb, the disease-bearing spirit of the Lord knew to pass over the first-born in Jewish homes. I rose from my dream on Maundy Thursday, the day of the Last Supper. Have I just experienced an Easter dream? In my dream, it is the Goddess - for surely this is She - not the God, who is at the center of things. This might make the dream all the more timely in Easter Week, since Bede told us that the word Easter is the name of a goddess, the Anglo-Saxon goddess Eostre. (Jacob Grimm, in German Mythology, turned her name into Ostara.) 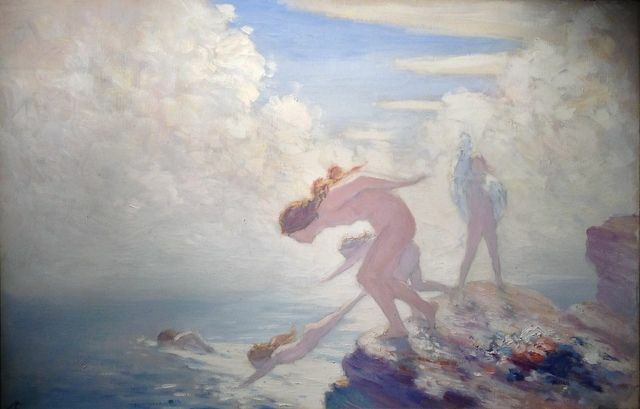 The original meaning of Eostre, some scholars say, is "Dawn". She is also called Daughter of Heaven. She is associated with fertility and abundance; hence all those Easter eggs and bunnies. The newborn lamb she fed me might fit right in. Dreams set research assignments, and I'll happily accept the need to dig further in these waving fields of mythic connections. For now, I am happy and grateful to accept the gift of the Goddess, and with it the strength for new creative work. These words seized the imagination of a people. They transferred moral courage and confidence. Let’s notice two distinctive elements in Churchill’s vision transfer that helped it to take root in the minds of many. The first is the time shift. He carries his listeners with him into the far future, beyond current dangers into a time where everything has long been resolved. He persuades his audience that victory over Hitler is not only inevitable, but was won long ago - so brilliantly that anything that has followed looks like an anti-climax. Churchill brings his audience inside his tremendous imagination, where the war is already won. We can learn from Churchill how to transfer a vision to someone in need of a vision. Let’s review the two key elements. First, we take ourselves – and then others – through the power of imagination to a future in which an issue or conflict has already been successfully resolved. We build a happy future we can believe in, and that imagined future gives us traction to get beyond current difficulties. Second, we inspire those for whom we are spreading a vision to rise above the current worries, and look at everything from a bigger perspective. We invite them to inhabit the Big Story, not the old history and the thousand reasons why success is impossible. We give them a bigger dream, and invite them to live that dream, and bring the world with them. 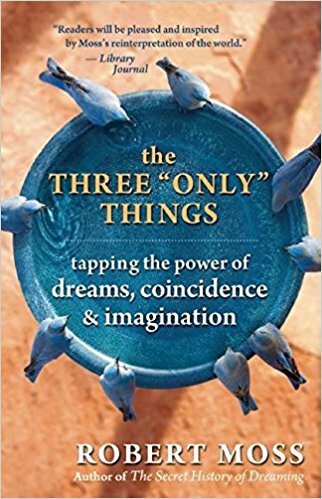 Adapted from Robert Moss, The Three “Only” Things: Tapping the Power of Dreams, Coincidence andImagination (New World Library). I arrive at my local airport and check in for my trip to Oakland and a weekend adventure in Dreaming with Jung that I will lead at a charming location in Berkeley. All is calm and easy at the Southwest deck, in a morning lull. I clear security, get strong black coffee, and pluck a book from my carry-on library to do morning bibliomancy. The book is an old favorite: The Language of the Birds, a collection of texts and poems involving shamanic traditions and interspecies communication edited by David N. Guss. It is full of pencil notes and post-it stickers from my previous readings. The book falls open at a photo I had failed to examine closely before. 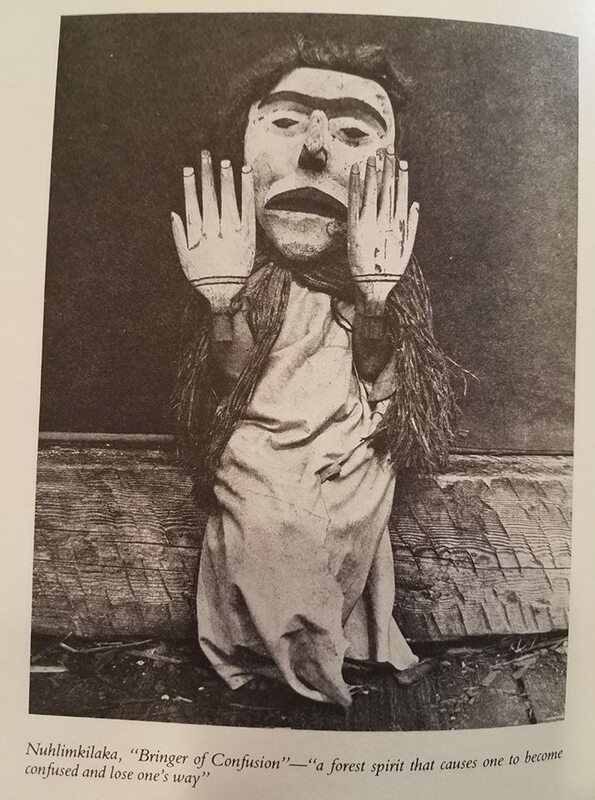 It shows a disturbing masked figure from a "winter dance" of the Kwakiutl of the Pacific Northwest. From the caption I learn that the dancer in this outfit embodies a mythic figure called the Bringer of Confusions, who uses his wiles to ensure you get lost and can't get out of the deep woods. Not the best portent for the journey I am beginning. I tell myself that the image the book has given me relates to the chaos in the country and the Bringer of Confusions who is watching TV and swinging a golf club in Florida this weekend. However, as above, so below. It is soon clear that the Trickster is directly at play not only in the affairs of the collective, but in my personal situation today. We are lined up by the numbers to board the first Southwest flight to BWI when we are told to sit down while a possible mechanical issue is assessed. Mechanics are on their way. It may take five minutes or 30 for the problem to be fixed. Half an hour later, the mechanics have not arrived. We are told to stay in the departure area because the plane could be cleared for takeoff as soon as they come, and we'll be left behind if we are not in the boarding area. I hover near the Customer Service desk, ready to seek alternate flights if necessary to get to Oakland today. An odd-looking man walks past me carrying a heavy staff topped by a decorated skull, half the size of a human head. Hard for me to read this as a good sign. The mechanics arrive. We are told to wait where we are. An hour later we were told that the plane is definitively broken, has been pulled to pieces, and won't go anywhere today. They will provide a replacement plane but it won't take off until 6 1/2 hours after our scheduled departure. It takes another half hour for me to get to the head of the line at customer service to see whether there is any way to get to Oakland airport today. Nope, nada. How about another Bay Area airport? Nothing. The best they can do is put me on a Saturday flight arriving after the scheduled close of the first day of my workshop. How about other airlines? "We don't work with other airlines." So I cancel and am told I can retrieve my checked luggage at the ticket counter downstairs. I stop at other airline desks on the way. "Can you do some magic and get me to Oakland today?" I ask a United lady. "I don't do magic well, " she demurs. However she tries. "IF only you had come an hour ago," she says, "we had one seat then." But an hour earlier Southwest had me captive upstairs. Same story with other airlines. No seat available on any itinerary that will get me to the Bay Area today. Not even when i offer to pay for first class at staggering cost. I am willing to do this because i don't want to let down the 40 wonderful dreamers who have signed up for my weekend workshop in Berkeley. How am I going to explain to them that I have to cancel? I'm afraid I am starting to lose my sense of humor and this always a very dangerous situation. At the Southwest ticket counter, a nice Earth Mother with Ireland in her face hears my story and goes to look for my bag. When she comes back with it, I try again, "I wish you could do some magic." "I'd love to do magic for you," she says. Another lady at a computer shakes her head. No seats. "Let me look." The lady who's ready to do magic takes over and finds a seat that wasn't there two minutes ago. 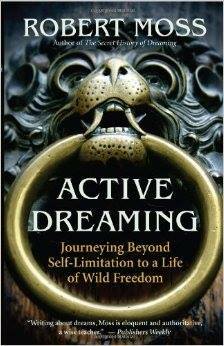 So I am scheduled to get to Oakland at 11 pm, just six hours late, in good time to launch our adventure in Dreaming with Jung. Magic happens, especially when you are open to it and invite it, even when The Bringer of Confusions is in the field. And it seems that Earth Mother trumps the Trickster. However, Trickster is always in play. Coyote Man greets me at the door of my new plane several hours later. I recognize him at once. Tall, lean, hungry, sharp-nosed, keen-eyed with a scraggly red beard on his pointy chin and spikes of red hair standing up on his head. The flight attendant confirms my impression by laying jokes on us - some dreadful, some funny - for much of the flight. Southwest is notorious for cabin crew who play stand up comics, but this one is outrageous and incorrigible. We get to Chicago Midway on time. Before I step off the plane in search of my connection, I say, "Thank you, Coyote Man,"
He's intrigued. "Tell me about coyote." "Trickster, comic, sometimes too tricky for his own good." "Go study Coyote," I suggest and then add, "No wait. You embody him." Safe landing at Oakland airport after 19 hours in airport/airline Bardo, arriving at midnight instead of 5 pm. Surrounded on my last flight by 113 young musicians in a school orchestra en route to play Fantasia at Disneyworld. The shapes of the luggage on the carousel in baggage claim were a wonder. I recently re-read Jung’s Symbols of Transformation, a massive revision of a work he composed thirty-seven years earlier, as he came to the parting of the ways with Freud. He noted that at 36, when he wrote Wandlungen und symbole der libido (published in 1912), he was still fighting to get out of the narrow box of Freud’s theories, and just embarking on the deeper journey towards death in the second half of life. 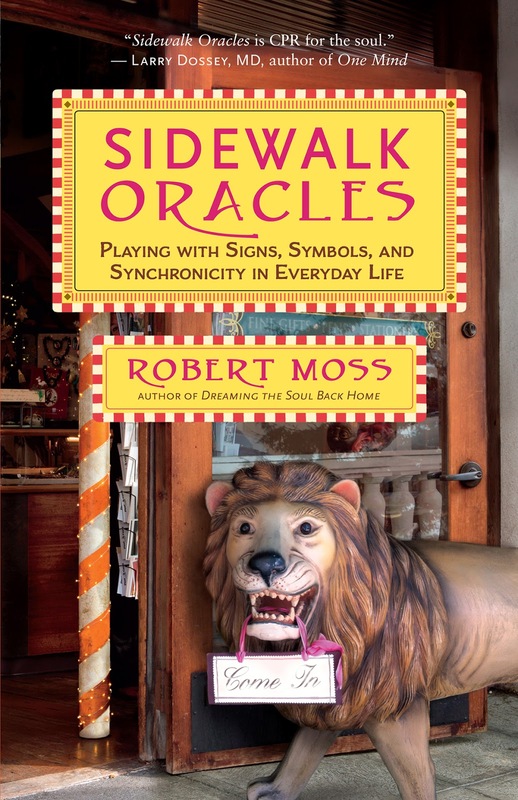 His introduction to the 1950 edition contains some fine general statements about our relations with myth, suggesting that if we are unconscious that we are living a myth, we may be driven by it to unfortunate or disastrous outcomes. He insists that psychology needs to learn from history just as history can learn from psychology. The seed of this book is a 20-page journal of the “autosuggestive” fantasies of Miss Frank Miller, an American woman, a writer and journalist and stage performer. Jung did not know her personally, and got several things wrong about her. Her name was not a pseudonym; she was named for her father in Alabama. Jung diagnosed her fantasies as “the prodromal stages of schizophrenia” and predicted she would eventually suffer a full schizophrenic breakdown; she did not. However, in 1909 she was admitted to a hospital in Massachusetts diagnosed with a “psychopathic personality” and a tendency to “hypomania”. 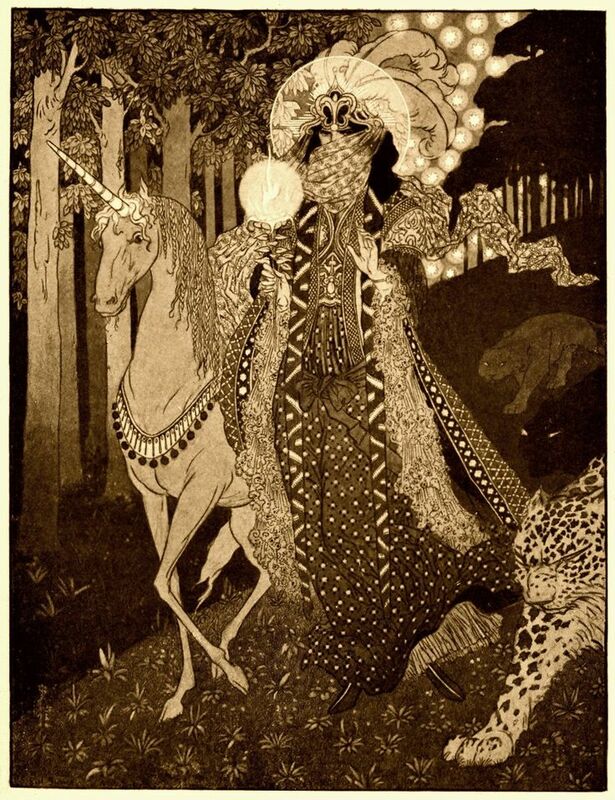 .Her fantasies were published in French translation by Théodore Flournoy, a professor of psychology at the University of Geneva and a student of the paranormal, in 1906. Jung read the French translation, not the original. It’s desirable to read this text (published as an appendix) before weighing into Jung’s immense commentaries. Miss Miller was clearly a woman of considerable education and intelligence; she notes where her knowledge had to catch up with her experience. She dreams a hymn of creation in which God first manifests Sound, then Light, the Loves. She notes she had not heard at the time of Anaxagoras, who imagined creation starting from chaos in the form of a whirlwind, which presumably involved sound. Jung's method in exploiting this material is an example of both circumambulation and amplification. He walks round and around the images, then allows himself to find their likenesses on the big screen, in the mythology and iconography of all the world’s cultures that are known to him. 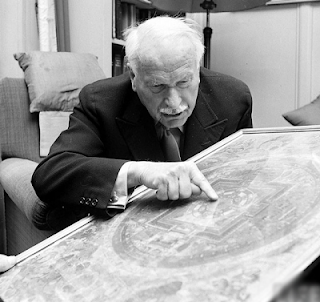 Jung’s approach – as he admitted many years later – may also be a textbook example of projection: what he finds in Miss Miller’s psyche are the contents of his own. "I took Miss Miller's fantasies as ... an autonomous form of thinking, but I did not realize [at that time] that she stood for that form of thinking in myself. She took over my fantasy and became the stage director of it, if one interprets the book subjectively. ...to put it even more strongly, passive thinking seemed to me such a weak and perverted thing that I could only handle it through a diseased woman." [Shamdasani, 2012, 27‐ 28] “And so I assimilated the Miller side of myself, which did me much good. I found a lump of clay, turned it to gold and put it in my pocket. I got Miller into myself and strengthened my fantasy power by the mythological material” . 1.Somu Shamdasani, "A woman called Frank". Spring: Journal of Archetype and Culture (1990) vol. 50, 25-56. In the satires of Lucian of Samosata, a Celtic man comments on a painting of Ogmios, a Celtic deity who looks like Heracles in his lion skin. He is depicted smiling and leading a smiling crowd with chains of the finest gold flowing from his tongue to their ears. It is explained that while Heracles conquers through strength, Ogmios wins through eloquence, which has the power to hold everyone in thrall. 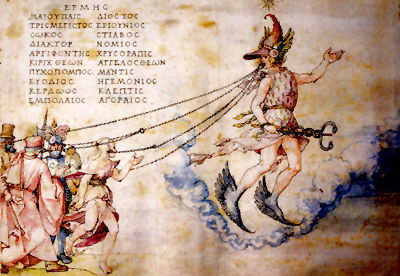 Albrecht Dürer depicted Ogmios with the caduceus and winged helmet and sandals of Hermes in psychopomp role, leading willing souls by chains of finest gold that stream from his tongue with his golden words. In lion skin or winged sandals, Ogmios is a god of eloquence I am ready to honor. His name first came to me in a dream. Though that name is largely forgotten, I find his spirit abroad, especially among those of us with Celtic ancestors, goading us to tell better stories and come up with fresh words. Lithuania is one of my soul countries and a place where I feel close to the Goddess. It is a country where the old Goddess tradition has survived unbroken from before the arrival of the Indo-European gods and is the country of the great scholar of the goddess, Marija Gimbutas. I have led six depth workshops in Lithuania over 15 years and had extraordinary encounters with the Goddess tradition here, as described in three of my books The Dreamer's Book of the Dead, Dreaming the Soul Back Home and The Boy Who Died and Came Back. On my first visit, I led a shamanic group journey to the ancestors through the gateway of an ancient oak, and I found myself in direct contact with a priestess of Žemyna, the great Earth goddess of Lithuania. The žyne (priestess) belonged to an ancient time. She instructed me in methods of healing and visioning involving the use of amber, and gave me symbols and words in old Lithuanian – a language previously unknown to me – that others in the workshop helped me translate. A woman healer in my workshops- a woodwitch from Samogitia (bear country in the west of Lithuania) - was inspired by my dreams and visions to invite me to her summer home. She taught me how to use amber and beeswax for healing, spiritual cleansing and soul keeping. She taught me spells in Old Lithuanian handed down in the maternal line for countless generations. She said these had never previously been shared with a man or a non-Lithuanian. I found, yet again, that the right dream can be a visa. I discovered first-hand that despite the long nightmare of invasion, occupation and persecution, the Goddess lives in the dreaming land, as the fire lives in wood. 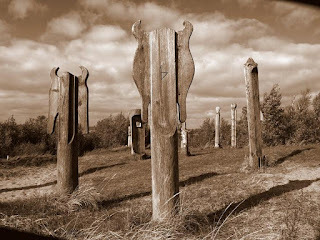 In my visits to the Baltic, I have been reminded again and again that one of the gifts of dreaming is that it opens authentic connections to the ancestors, offering us the chance to heal the wounds of the past and to perform cultural soul retrieval. Image: Žemaitiu alka, a shrine to the old gods and goddesses at Palanga, Lithuania. When she stands again and turns to face the circle, there is a moment’s hush before we applaud her and celebrate what she has done, because we are amazed. 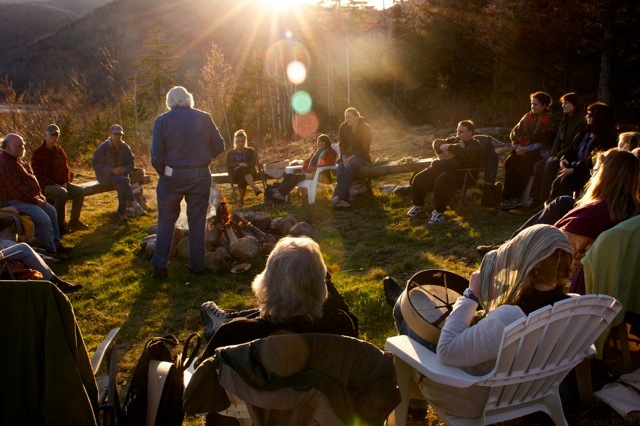 In a fire ceremony like this, people bring many things they wish to release: old habits, fear or guilt, addiction or attachment. She has just sought to release a multigenerational history of stunted lives and toxic relations. Instead of casting out the men who blighted the lives of their women, she has asked to free them, back through the bloodlines, back through time immemorial. She has asked for deep ancestral healing, and she has asked as a woman of power with the right of the priestess to forgive and to intercede. She explained that Kate was her Irish great aunt, Caroline her German grandmother. Both were long deceased, but both had come through to her as spirit helpers in the soul recovery work we had been doing with the group. They had helped her recover a desperately sad and lonely six-year-old part of herself, who had been left in a foster home and cruelly separated from the father she loved, without explanation, and then beaten for mentioning him. 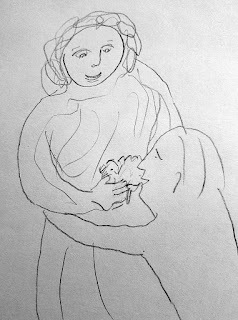 Though she remembered Caroline as aloof and rigid, this grandmother now appeared as warm and loving, urgently concerned, wanting to assist in healing all the family, across the generations. We were both filled with gratitude for the help that becomes available when we make ourselves available for soul work. Guided by strong women of her family reaching to her from the other side of death, Irene sought to free the generations of men in her bloodlines who were trapped in powerlessness, sorrow, and addiction. I believe she made a difference that night, bringing light into many lives across time and across dimensions. Her example may inspire us to seek similar healing for our ancestors. We live by stories. 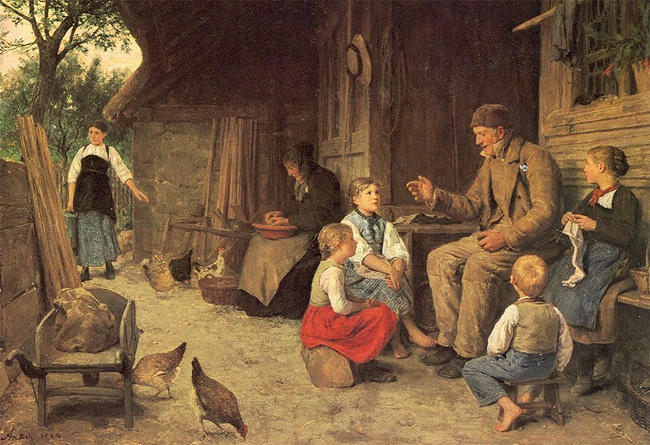 Our first and best teachers, in our lives and in the evolution of our kind, instruct and inspire by telling stories. Story is our shortest route to the meaning of things, and our easiest way to remember and carry the meaning we discover. A good story lives inside and outside time, and gives us keys to a world of truth beyond the world of fact. Consciously or unconsciously, our lives are directed by stories. If we are not aware that we are living a story, it's likely we are stuck inside a narrow and constricted one, a story bound tight around us by other people's definitions and expectations. When we reach, consciously, for a bigger life story, we put ourselves in touch with tremendous sources of healing, creativity and courage. How do we find the bigger story in our lives? The answer is easier than we might think. The First People of my native Australia say that the big stories are hunting the right people to tell them.. All we need do is put ourselves in places where we can be found. Is it too late to hope that we can bring back storytelling in our modern urban consumer society? I think not. As we practice telling our dreams and the stories of our life experiences simply and vividly we become bards and griots and storytellers without labor. The first step in the Lightning Dreamwork game requires us to encourage whoever is ready to tell a dream (or, for that matter, any life experience) to tell it simply and clearly, without background or analysis or interruption or reading from notes. We give undivided attention for the duration of the telling, and require the teller not to miss the opportunity to claim her audience. Scheherezade tells stories so she may live through another night, and tells them so well she turns a monstrous tyrant into a decent human being. You must know your story and tell your story and have your story received. This is a central teaching of the Sefer Yetzirah, a seminal text of Kabbalah. Learn to do that, and you can survive the worst nightmares of history, and bring heart and healing to others. swims in a marble bath through whose deeps a river tumbles, or lies all morning on the edge of it to dry slowly in the sun, and watches the heaving river trouble the deeps of the bath. It flows through the caverns of earth for further than she knows and coming to light in the witch’s bath goes down through the earth again to its own peculiar sea….When there is blood in the bath she knows there is war in the mountains. 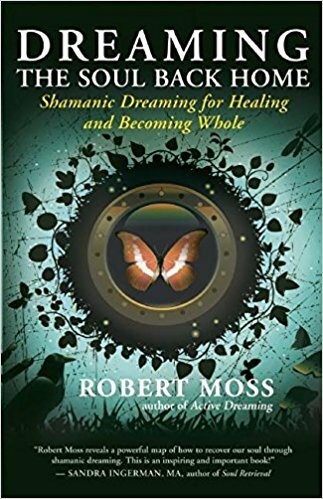 I lead group shamanic journeys to an airport that won't be found on any ordinary map. They leave their bags, check in, go through security and board a plane that will take them to a destination where the dead are alive. Instructions for this crossing to the Other Side are in my book The Dreamer's Book of the Dead. During my air travels over the weekend, I sometimes felt that I had stepped into my own dream scenario, or that it had spilled into my world - or that, at least, I had been cast in a new episode of The Twilight Zone. “Neither will my husband,” smiles the woman passenger. A male airline agent intervenes to take my bag and issue my boarding pass. "You got the Shakespeare seat," he congratulates me. I don’t get it until he says my seat number out loud. "2B." I catch up to the stranger the other agent wanted to make my wife. She has a broad, open face and sensible shoes. She looks ready for a genteel country walk, or to give a tutorial. "I need to know who you are," I tell her. 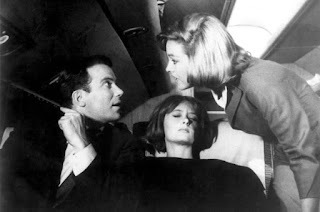 "The airline agent was so keen to play matchmaker that there must be some connection." "I'm a vertebrate paleontologist," the stranger tells me brightly. She helps me out by adding, "I study dinosaurs." "So we have something in common. I tell my psychology friends that I am a Paleolithic psychologist." I show this to the Vertebrate Paleontologist and we exchange our website information. I distantly recall an episode of the old TV series "The Twilight Zone" in which the people on an airplane are thrown back across time. As I recall, the episode ends with a glimpse of a grazing sauropod dinosaur, and no resolution. You never know when you might need expert advice on a dinosaur situation. The airport public address system is busy this morning, with announcements about other things left at the security check. In ascending order of strangeness: a jacket, a belt, a cell phone, a driver's license, a passport, a purple cane and one shoe. How do you leave behind one shoe? This only records the visible things missing from people in my airport Bardo today. After I take my Shakespeare seat on the plane, the airline agent who tried to marry me to the Vertebrate Paleontologist rushes down the aisle and spills two pens in my lap. Certainly I can write two things at once. 2B or not 2B, sure. How about 2C? When I look across the aisle from my Shakespeare seat, the fellow in 2C is doing amazing things with a salad in a clear round plastic container he has brought on board. He spins it between his palms like a wheel, he shakes it, he spins it a different way. I get that he's trying to get the dressing nicely mixed with the leaves but this goes on for ten minutes. It seems this is his version of spinning a Tibetan prayer wheel or doing asanas. I wait until we are landing before asking him what was in the salad dressing. "I've never seen Salad Yoga before." He tells me it's a Thai dressing from Panera, an "intense" experience. Evidently. Settled into my seat, I am rereading the Bhagavad Gita while sipping a gin and tonic. I am distracted by what is going on in the row in front of me. Sarah Sanders is sitting in the window seat. A hyena-like younger man is chatting her up. Their conversation gets louder as they toss back free drinks. Now they're talking about online dating and what lies it's okay to tell intimate partners before and after dumping said partners. Am I dreaming? No. But I realize this is not the Sarah of the briefing room but a lookalike of her possible future self, ten years older and thirty pounds heavier. As we get ready to disembark, I say to her, "Thanks for the entertainment." She blushes to the roots of her hair. "You mean you could hear us?" "Every word. But I decided not to record you this time." I look behind me and there she is again, the mountainous woman in the Zulu hat, coming down the ramp. I step on board the plane and the flight attendant takes my coat, as he did before. "Sorry to bother you again," says the man who needs me to stand up so he can sit in the window seat. He fires up his computer and starts watching the same old movie he was watching before. The man who is going to sit behind me fumbles with stuff in the overhead compartment and I brace myself in case he lets something fall on my shoulder as he did before. But he catches it this time, pats my shoulder and says, "Good thing I knew what was going to happen." "We've met before," the man across the aisle says to the woman next to him. She says, "In your dreams." These are vignettes from the Bardo of my air travel during my trip home from Atlanta on Monday night. The first plane broke. They found us another plane, unbroken but otherwise identical, where we took the same seats we had before. It was deja vu all over again. People were blurry, taking off after midnight, 2 1/2 hours late. Hard not to feel we were in a Twilight Zone episode in which things go on repeating until you wake up to the fact that you are dreaming, or dead, or both. Photo: William Shattner in the 1963 Twilight Zone episode, "Nightmare at 20,000 Feet"